The telecom companies don’t want a neutral Internet. They built the pipes and hooked them up to your phones. They also sell you broadband fiber at Rs 800-Rs2000 per month. And they hate to see you spending more time on messenger and chat apps which are getting better by the day. Unlike Gtalk and those of its ilk, today’s apps are on phones, untethered from the computer and therefore as personal as it gets. Their quality? Almost as good as a voice call. And that’s where the trouble lies. Dave Mcclure’s recent defense of the valuation of Unicorns reinforces the case for modern Internet businesses that are poised to disrupt the Fortune 500s. The prospect of the large telcos being uprooted by these Internet businesses is very very real and has not been more threatening than it is now. Because the telcos have now started to either resist the enemy or have started sleeping with it. Either way, they cannot ignore the enemy. But we do need the Airtel’s and Vodafone’s to own those pipes that will carry those meek software signals. We can’t disrupt those pipes if we want our software to disrupt the world. Those who own the pipes will keep inventing new experiments aimed at spoiling the party. Someday, one of these experiments will succeed. Whether it’s Airtel’s net neutrality gambit, or the recent Airtel One which for now allows free trials, or the Airtel Zero which allows Startups to pay for giving free access to their users. Once public memory has receded and Airtel Zero gains acceptance, they may get emboldened and even sign on a free Facebook and free Youtube. Time will tell. It’s just another way of having differential tariffs without charging the user upfont. If Airtel had succeeded in differential pricing for Whatsapp like services, you and I would be paying for that usage. Fortunately for consumers, that move got scuttled. In its Airtel Zero play, the content providers are paying Airtel to allow we the junta to use it gratis. Ultimately in both these experiments Airtel is the one that wins, with someone putting cash in the bank. If differential pricing does come in some day, no prizes for guessing whether Hike messenger would be subject to similar restrictions, and certainly none for guessing the fate of Jio Chat if Airtel had their way. This really brings me back to my hypothesis that in this case Airtel (and its counterparts) will have their cake and eat it too. Eventually. Unless another Startup chooses to become a data-only Telco with a eat-as-much-as-you-can data pack. Lets look at another scenario where email transforms and becomes as good as chat. What would be the difference between instant messaging (as in real time chat), vs a scenario where everyone is on gmail and messages are delivered instantly to each person on the Gmail network. Google could actually do that since then it doesn’t need to depend on asynchronous smtp protocols for Gmail-to-Gmail delivery. If Google were to try this, the day would not be far off when they would re-invent Gmail (since Gtalk is dead) to be more spontaneous, more Whatsapp like and less of a pre-planned hideout like Hangouts. You must have guessed by now where this argument is leading to. If you and I were to end up paying for Whatsapp and Skype chat, we may soon end up paying for Gmail. Sure, the telcos only want to charge for voice usage on these networks for now. That’s how it usually starts and then you start expanding your argument to ring-fence more and more unsuspecting folks into the playing field which you own and where you make the rules. This hypothesis, by the way, is not just about cost. It’s as much about content. If you are forced to play in someone else’s playing field, not only do you have to pay the rates they charge, you are also restricted to playing (or watching) the games they want you to. Free services given on preferential basis (e.g., free Facebook but no free Google) will eventually thrust the Facebook world view on you. One that is not unbiased, not empirical and certainly not a view that’s shared by all. Imagine being left out of access to unbiased news, grassroots journalism, views of specific political parties and certain critics of those who control this free service. I don’t really fancy letting these seeds to be sown today and neither should you. Else, my dear friend… the Internet won’t remain neutral forever. P.S. 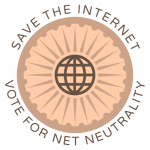 — edited on 13/Apr… if you want to really make a difference, voice your opinion on the savetheinternet site — click here.